They aren't spoilers. They're enhancers. I'm delving into truly controversial ground: spoilers. I don't care about them. I have no aversion to them. In researching how common this is, since I hear so many people objecting to them, I didn't find any studies on percentage of people who care vs. percentage of people who don't, but I did find a very interesting article. 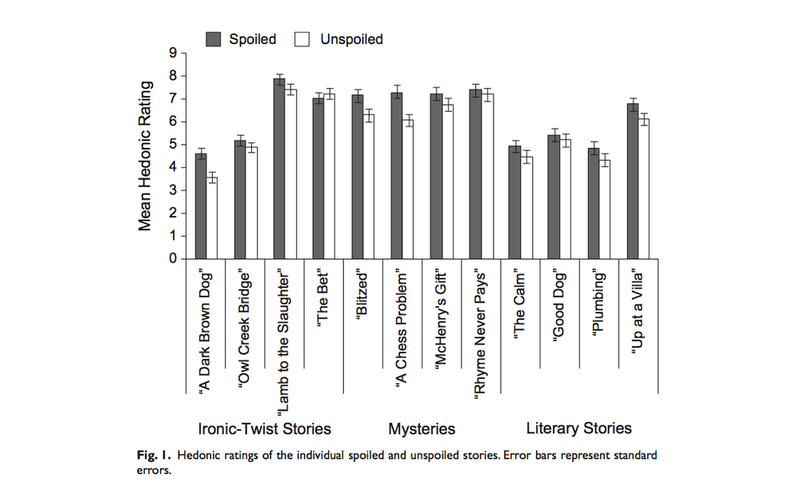 There's been a well-executed study done on enjoyment of spoiled stories vs. unspoiled stories, and the result may surprise you. First, the science. Then let me back it with some common sense. The study took more than 700 people and simply asked them to read stories and rate their enjoyment of the stories. Some of the stories were spoiled by the introduction, wherein story elements were introduced prior to the reading of the text. The result? The author, after graciously conceding this is a good study, then goes on to explain why it's wrong. However, I believe he's wrong. That is, he's discarding science for emotion. He's wrong. Let's jump to the common sense back up for this science. Do you rewatch movies you enjoy? Do you reread stories you enjoy? Of course you do, but why? If you hate spoilers, you've already completely spoiled the story yourself, but somehow that doesn't lessen your enjoyment of the experience. When the movie trilogy of Lord of the Rings was introduced, I went and saw it, even though I'd read the stories and the movies were nearly identical. Knowing the plot twists and outcomes didn't lessen my enjoyment of the story. People who complain about getting spoilers are really invested in the story they're anticipating. I've been looking forward to Star Trek Into Darkness since the movie was announced in 2009. THAT'S 3 YEARS OF ANTICIPATION! Using "Into Darkness" as an example works for me. I'm a Trek fan. I anticipated the movie. I had no aversion to spoilers. Note that he's using himself as a case study to prove these points, so my experience is an equally valid counter-argument. 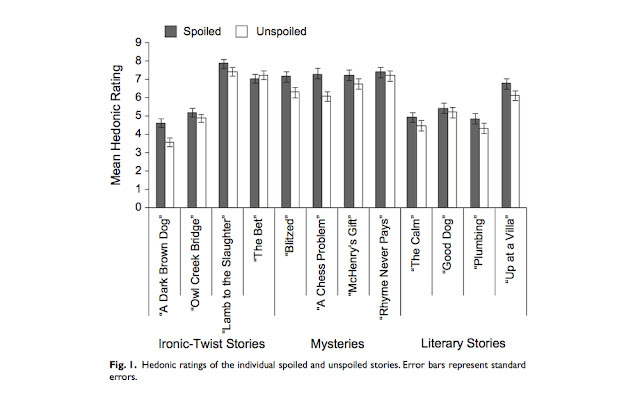 This experiment measured how much individuals enjoyed literature that was spoiled for them. But if you talk to anyone who's experienced a spoiler, they usually talk about getting mad. Anger at having a story spoiled and enjoying a story are two very different things. To put this simply, that's dumb. I hadn't heard the term "spoilers" until a few years ago. Nobody objected to them in the 80's. In fact, many people used (and still use) plot information to decide whether a book or movie is something they're interested in. The aversion to spoilers is something societal we made up a few years ago. The response to spoilers is a learned one. A fact of the human experience is that while we often can't control what happens to us, we can control our response. That includes our emotional response. Some people have bought into the idea that hearing spoilers should anger them. They get angry. The rest of us are baffled by this societal development, that somehow story-telling should offend someone. Note that this learned response is inherently selfish: "I don't mind if I spoil the story for myself. I'll see/read it again and enjoy it more the second time. If you spoil the story, I'll have a tantrum and resent you for life." But another huge factor is how you approach strong emotions. For a lot of people, intense suspense isn't a fun experience - it's something to be avoided. Psychologists call this experiential avoidance - the tendency to avoid thoughts, feelings, memories, and physical sensations that are unpleasant. For people who hate suspense, intentionally reading spoilers could really improve their movie watching experience. This seems to have some validity until one thinks about it. The first paragraph is simply wrong. As a long time Trek fan, I had no negative reaction to "Into Darkness" spoilers. Once again, I haven't bought into the learned response of upset/anger when someone else shares story elements with me. Paragraph 2 isn't true, either. Again, we rewatch and reread stories and the suspense is still there, even knowing the outcome. Think of your favorite television series. With few exceptions, the main cast isn't ever going to die even when the writers put them in peril. You know this, yet their exposure to danger still works to create suspense, and you'll rewatch your favorite episodes. In short, this author wants to discard science and common sense to justify his sense of entitlement to experience a story solely on his own terms. As members of society, we don't get to do much solely on our own terms. In fact, that's part of the fun of the human experience. The interaction, the story-telling, the shared experience are fun. Most of us thrive on them. We've been telling and retelling stories around our fires since we developed language and fire. So, if you hear a story enhancer, chill. Engage your rational mind, discard the learned anger response and substitute for it the enjoyment of sharing a story with someone. You'll enjoy your movie and life more.